Dr. Stephanie Sims grew up in Dublin and graduated from Dublin Jerome High School. She attended The Ohio State University for her undergraduate studies majoring in biology and business. Throughout her undergraduate years, she was vice president of the Pre-Optometry Club, volunteered as a Young Life Leader at Westerville North High School and worked as an optometric technician/optician at Northwest Vision Center. While in her third year as an undergraduate, Dr. Sims received early admission to The Ohio State University College of Optometry. During optometry school, she was president of Optometry Ambassadors, and held leadership positions in Beta Sigma Kappa honor society and Fellowship of Christian Optometrists. She was also a member of the American Optometric Student Association. Dr. Sims has gained experience in cataract surgery co-management and Refractive Surgery co-management at Northeast Ohio Eye Surgeons in the Akron area. She also gained experience in ocular disease at the Columbus VA Care Center. 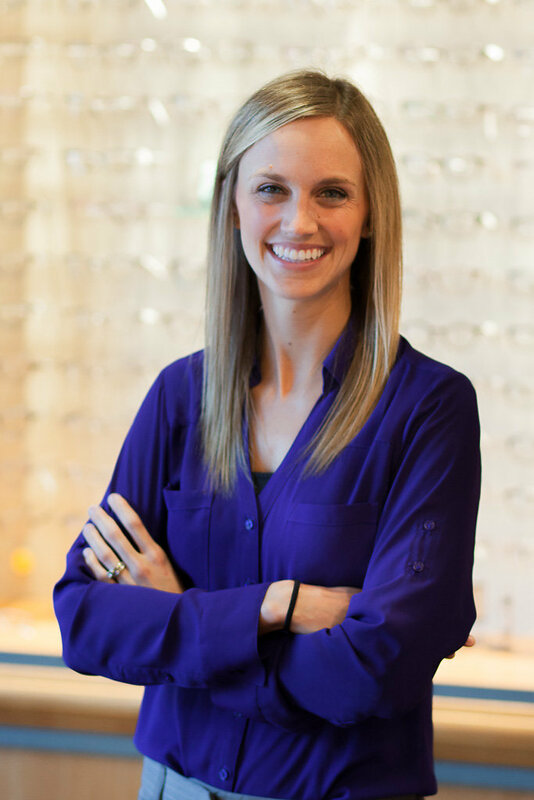 Her experience in pediatrics, binocular vision, vision therapy, and contact lenses allows her to provide care to patients of all ages. Dr. Sims is an active member in the American Optometric Association, the Ohio Optometric association, and the Central Ohio Optometric Association. She also recently went on a mission trip to Haiti through Mission of Hope to serve in their vision clinic, providing glasses and treating ocular disease for those in need. Dr. Sims and her husband Matt, also a Dublin native and Dublin Jerome graduate, live in Powell where they are involved in Olentangy Liberty’s Young Life and are very active in their church. In her spare time, Dr. Sims enjoys spending time with family and friends, working out, cheering on the Buckeyes, and playing with her furry child, her puppy named Chandler.